Imagine the perfect storm of video game dislikes. Pretend you have never played World of Warcraft (and thus know nothing about the characters), and that you vehemently dislike free-to-play, but that you’re also not even particularly interested in card games. Because that’s me, you see. So how exactly is it that a game combining all of those things exists and is one of the best games released so far this year? Respect plays a large part in it, of course. Blizzard never seeks to nickel and dime you throughout your experience with Hearthstone, so if you’re not an inquisitive type, you’d never even know there were micro-transactions in the game. On the PC version, it even reminds you (before purchasing) that you are spending “real money” if you choose to go ahead. This is how you do F2P, you respect the player and their time. Because in fact, you never actually need to buy a thing. I haven’t, and I don’t see any point going forward where I will. Cards are unlocked initially as you level up each character (there are nine and they are all equally playable thanks to their unique skills and decks), with expert cards rewarded through the arena, card packs, or crafting. Note that I mentioned card packs there, which are the things you can buy with real money if you so choose, but you can also unlock them by completing challenges which reward you with currency. 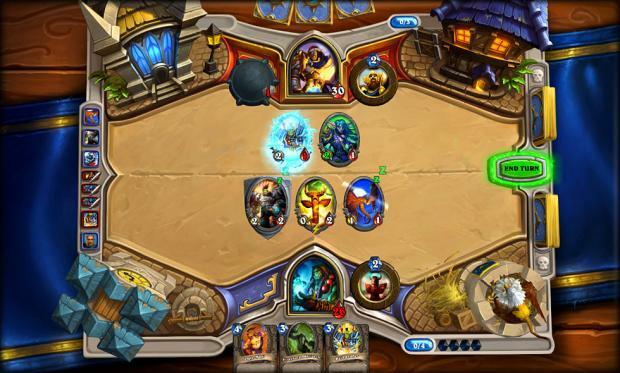 Fundamentally, Hearthstone is a card game that uses World of Warcraft as its lore-base. 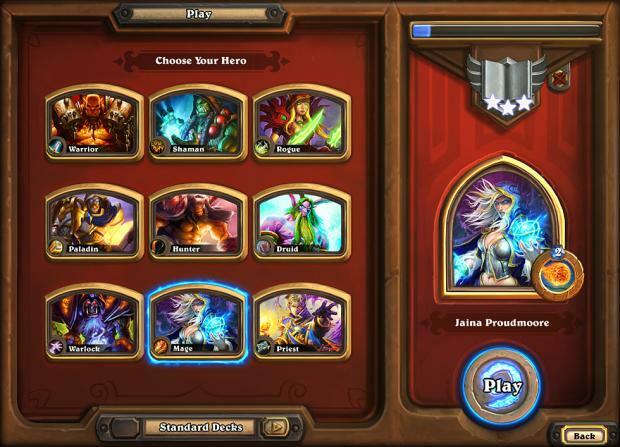 The titular heroes all have different classes (though initially you can only select Jaina the Mage, but you unlock the others by beating them in the practice mode), which means they also have different cards specific to them and even a different base skill that can be used for two gems each turn – one heals, one attacks, another summons a 1/1 minion. That means that, sure, you’ll end up with a favourite, but you’ll rarely just stick to one. This is also (in part) thanks to Hearthstone being so utterly playable, that you’ll enjoy levelling up as much as simply just playing the game. Starting with three cards means you’ll go first (four cards means you go second), and initially you can only play a card worth one gem. 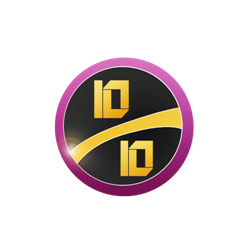 Every turn will see each player get an additional gem, up to a maximum of ten, and they (of course) are replenished, each turn. If you want to win against skilled players, you’ll need to be tactically on point at all times. One mistake can lead to an absolute rout, and a defeat in the blink of an eye. Every card will have an attack and defence stat, but many will also have an additional ability. Taunt is one of the most basic, but also most useful, as it forces your opponent to focus their attacks on them, meaning they cannot attack your hero. Others will buff your attack or defence, or can deal direct damage to the hero. Some can turn your minion into a sheep, another still can force your minion back into your deck, meaning you have to play them again (next turn) to get them back onto the board. One particular match, I just hadn’t noticed that an enemy minion (or card, if you like) was collecting +2 damage for every hit they took (and that card has high health), so rather than sacrifice one of my better minions, I concentrated on thinning my opposition’s ranks. Huge mistake. Before I knew it, that buffed minion destroyed me, and taught me a valuable lesson: do the mathematics, and make sure you know you can survive the next turn before rushing to attack the opposition. Hearthstone is littered with tales like these, and every time you play you’ll experience immense pleasure, as well as frustration – but it’s always because you rushed, or made a mistake. Don’t expect real people to be as forgiving as the practice arena – hell, don’t expect your friends to give you a chance, either. But the elation is unparalleled – I honestly can’t think of many games that are as consistently rewarding in victory as Hearthstone. 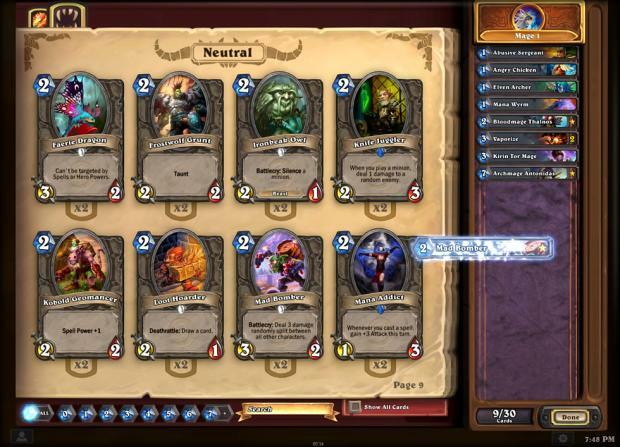 The depth is almost bewildering, and if you want to get seriously into Hearthstone, you can build your own decks, so that you never see particular cards in your hand. But if you just want to drop in and out, at the beginning of each match you can veto any of your starting cards, so if you get stuck with three cards all requiring five gems to cast, that’s your fault for not switching them out. Very occasionally things can backfire from the very start, and after a decent amount of experience, you’ll know a few turns before a match ends who is going to win. One of the absolute best things about Hearthstone, however, is that thanks to it using your Battle.net account, you can play on PC or iPad and nothing changes. In fact, you can even play on the iPad against a friend on their PC, and it feels incredibly smooth, even down to the integrated chat that can be brought up at the tap of an on-screen option. It doesn’t need to, but it looks and sounds good, too. The visuals are crisp and full of character, and the audio snippets add colour to what is, let’s face it, a card game. VERDICT: Not only is Hearthstone one of the best F2P games I’ve ever played, it’s unbelievably deep, rewarding, and satisfying. Whatever you may think about World of Warcraft, Blizzard have crafted an incredible experience with Hearthstone, and regardless of platform, all you need is a free Battle.net account to play it. One of the purest forms of digital crack I’ve ever experienced. Whatever your gaming habits, this is one you need to try as soon as possible. Review based on PC beta and final iPad code.